Black plays at the marked point to create a good territorial formation. This opening became very popular in the first decade of komi Go. 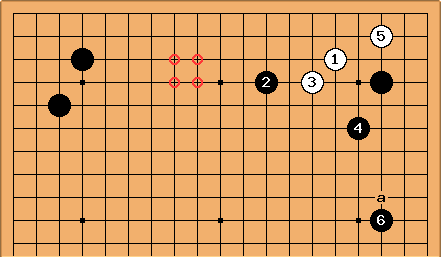 It developed partly because White's second move ( potentially played where is) was less routinely played to prevent it (the Shusaku fuseki became less important for White taking komi); and because of experience with earlier use of the enclosure at a. That is still played, and enclosures at b and c are also tried occasionally. In the modern style Black will sometimes now play at d.
When White approaches low in the right-hand corner, became the orthodox choice of pincer, though all types of pincers were tried over hundreds of high-level games. 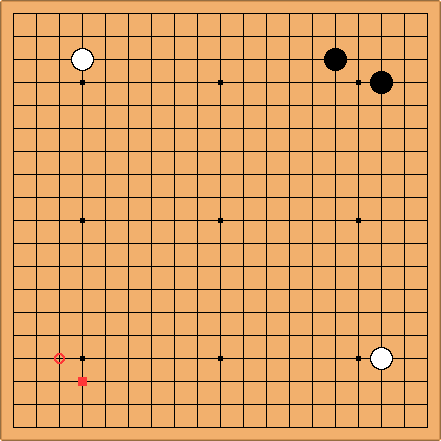 Later Kobayashi Koichi adopted this pattern, with Black playing the pincer at a. This continuation became settled theory ( may be held back to a). White lives in sente. Now the area of the marked points becomes important. When White makes the high approach here, Black at a is the usual play. The pincer at b will turn out well for White if the correct variation is chosen (on the page about the attachment response to this pincer apply the ladder-dependent variation in 1.1.1) (this reference isn't clear). The pincer at c is played sometimes in high-level games, but Black must seek complications to gain advantage from it. This is the position after the main variation of the pincer at ''c''. 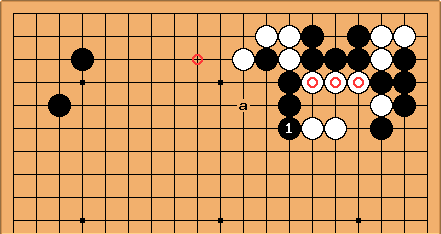 White ends in gote but can regard plays in the directions of the two marked points as being nearly miai for a follow-up. The nadare has been tried many times by pros. 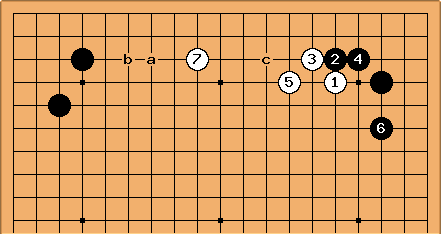 An interesting idea (Cho Chikun in 1972) in the application of the traditional ''onadare'' main line was to replace a by here. Black is aiming at an attack at the marked point, to make good use of his enclosure. The variations become complex, with White sometimes sacrificing the stones to escape shortage of liberties caused by the bamboo joint. 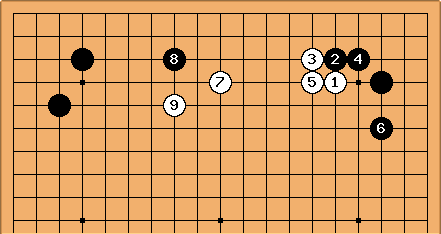 The classic pattern here is, however, with this standard joseki. Black takes sente, having secured both corners. Black at a is a checking extension setting up an invasion at c, which is therefore very big; Black at a or White at b will be played soon. A surprising idea that must have been born out of professionals' dissatisfaction with that result is to play as a probe in Black's enclosure. This has been seen in numerous games. chrisg I found this in Kombilo whilst playing through an old game of mine, and was quite surprised by it. The continuations I found had continuations with 'a' through 'c' marked, 'a' seemed to end up in a sequence with a ladder to the bottom right, where B plays a ladder breaker, 'b' seemed to revert to the standard fuseki, with the exception of the exchange. I can't really say much about 'c' though. 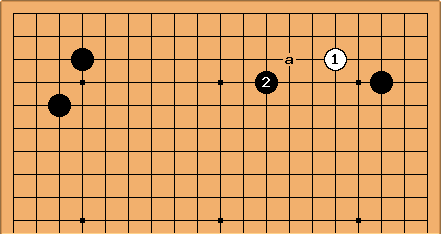 An innovation of Takemiya was to play for central influence by making the solid connection with here, and extending on the fourth line. 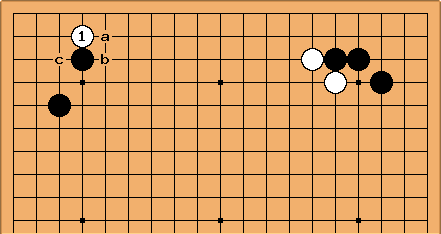 This assumes White's nirensei on the other side of the board. Bill: Does it make that assumption? An idea from Kitani Minoru in the late 1950s is for White to play a wedge on the side instead. 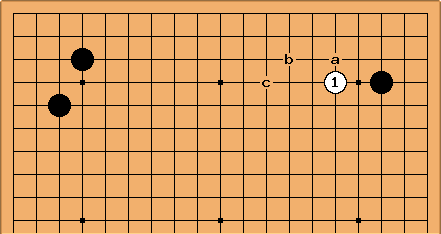 White 1 is the point chosen in pro games: none of a, b or c is seen. 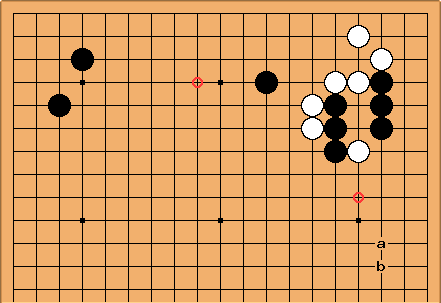 After and , White has the minimum external pressure from Black's corner formations. If Black played at a White would be happy to answer at . This way of playing has been adopted from time to time by top players, so is presumably reasonable considering komi, to simplify the game. For more advanced discussion see BQM 371. See enclosure opening distant low approach, pincer for discussion of an interesting less-used pattern. Much less common are the enclosure opening-style sides based on enclosures using the 3-5 point. These are discussed on the 3554 enclosure, 3555 enclosure and 3564 enclosure pages. The analogues for 4-4 point, 3-3 point and 5-4 point enclosures of this side pattern are all rare: enclosing the right corner would normally take priority. Bill: What about those openings where Black's second move is an enclosure? They are enclosure openings, too. Charles Quite true: + as an enclosure has been played since about 1820. See Black 3 is an enclosure. 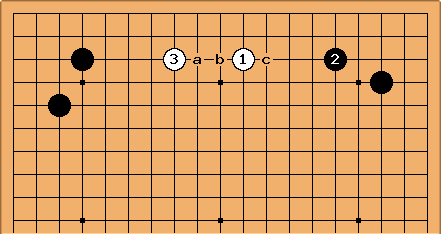 It does tend though to become a tasuki fuseki: often enough it can transpose into the regulation fuseki or the analogue with a 4-3 point not a 3-4 point lower left. In fact I guess it became popular mainly because Black expected to play lower left and wanted to see and before choosing how to occupy the corner (that is, intended as a probe.) Very classical stuff, anyway. Bill: According to Takagawa, the enclosure of the top right corner with was a common response when was not the facing 3-4 point in the top left corner. Charles If it is the 4-3 point, rather, then encloses, in the lower right at 3-4 is interesting for White, I think. Given the theory of the time, I think White might have felt she's achieved something already here. That is, Black at either of the circle or square points is playing into an opposite komoku. Which (to this day, it seems) pros avoid. 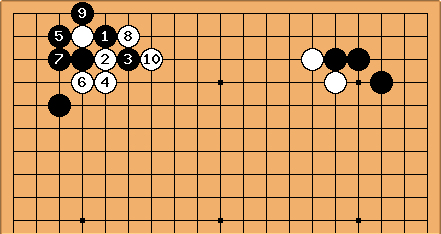 Therefore Black would presumably play takamoku or mokuhazushi lower left (at that time); and White doesn't feel so far behind on territory. larsen: Well, I suppose Black can do quite well playing a straightforward hoshi in the given position. It makes miai of approaching either komoku, and the high approach supported by hoshi tends to be quite pleasant to play. Just a fuseki by-way. But the old guys put a huge effort into these nuances - something one picks up. The board has been rotated 90 degrees counter clockwise for convenience.